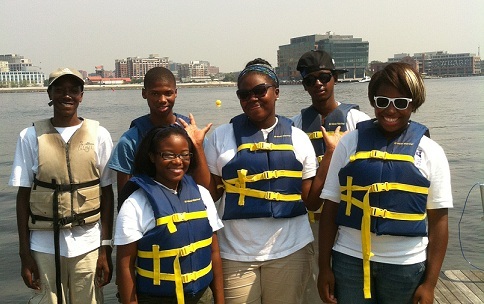 The Hanna M. Crafton scholarship will help support the Downtown Sailing Center ’s SIT program, creating opportunities for workforce development and college preparation for Baltimore youth. The proceeds may be used to directly fund SIT training or a special program or other opportunity for an SIT student at the discretion of the Downtown Sailing Center’s Scholarship Selection Committee. This Committee with include the Crafton Family, the Program Director, the S.I.T. coordinator, a board representative and other stakeholders. This scholarship has been created by James & Lise Crafton in memory of their daughter, Hanna. Hanna was a Superkids instructor at the DSC who was touched by the warmth and spirit of her students and inspired by the dedication of her SIT peers. The Hanna M. Crafton Scholarship is to be awarded annually to a deserving sailor(s) whose character is demonstrated by a combination of compassion, teamwork, leadership potential, academic achievement and financial need.